Ruby or Red pomegranate mining began 2,500 years ago, and until now, rubi mining Red pomegranates are still carried out in parts of Asia such as Thailand and Burma, Australia, Pakistan, Afghanistan and the United States. But Burma, now known as Myanmar, is the most well known source of Ruby that is very clear. Studies show that pomegranate mining in Burma can be used to trace back the Stone Age and the Bronze Age, as evidenced by tools found in the mining area. Thailand, on the other hand, is now considered the most important trading center in the world when there is trade in ruby gems. There are also discoveries of rubies in several regions of Vietnam and most recently in Madagascar. Ruby has long been recognized as one of the rarest and most valuable of all gemstones. Admired for its hardness and brilliance, with a bright red color. The most valuable Ruby is those from the country of Burma, which is now known as the country of Myanmar. The best area known for Rubi is Strike Valley, located about 200 km northeast of Mandalay in north-central Burma. In this regard it is believed that Ruby mining in this region has been active for more than 1000 years, and this is a rare source of Ruby "Pigeon’s Blood". Burma's best rubies have high color intensity and fluorescent quality, where gems really appear to shine. Some very good specimens also have velvety softness due to small rutile inclusions known as "silk" in commerce. The Mogok Valley in Upper Myanmar (Burma) has for centuries been the main source of rubies in the world. The area has produced some amazing rubies, but in recent years some good rubies have been found. In central Myanmar, the Mong Hsu region began producing rubies during the 1990s and quickly became the main ruby ​​mining area in the world. The most recent ruby ​​deposit found in Myanmar is in Namya (Namyazeik) located in the northern state of Kachin. Historically, Ruby has also been mined in Thailand, in the Pailin and Samlout Districts in Cambodia, and in Afghanistan, Australia, Brazil, Colombia, India, Namibia, Japan, and Scotland; after the Second World War ruby ​​deposit was found in Madagascar, Nepal, Pakistan, Tajikistan, Tanzania and Vietnam. In Sri Lanka, shades of lighter rubies (often "pink sapphires") are more common. The Republic of Macedonia is the only country in mainland Europe that has natural rubies. They can be found mainly around the city of Prilep. Macedonian Ruby has a unique raspberry color. Rubies are also included in Macedonian arms symbols. Some rubies have been found in the U.S. state. in Montana, North Carolina, South Carolina and Wyoming. Most Burmese Ruby stones are currently found from different locations, namely from Mong Hsu, Shan. The Mong Hsu deposit was discovered only in 1992, the deposit was so large and considered the most important discovery of Burmese Ruby for thousands of years. 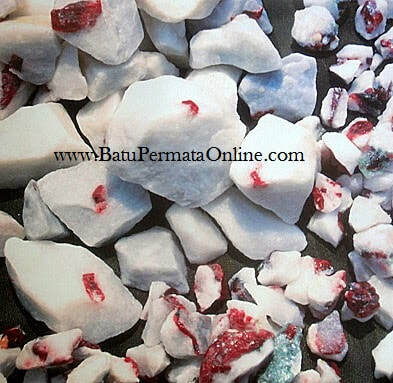 But this Rubi Mong Hsu does not have the same quality as the famous Rubi Mogok stone, they have a tendency to hue that is slightly bluish or purplish and unattractive. The color can be improved by heat treatment or heat treatment, so almost all Ruby Mong Hsu on the market has been treated. Before the discovery of the Rubi Mong Hsu deposit, there was a long period when almost all of the world's supply from Ruby came from locations outside Burma. In 1962 there was a military coup in Burma led by Ne Win, and the military junta government took over the Ruby Mogok mine. The Burmese region is almost closed for decades. There is a strict trade embargo and restrictions due to human rights violations there, and some countries, especially the United States, prohibit every export from this area. The world was forced to look for another place for Ruby, and they seemed to be turning to Thailand, because Thailand had the largest supply of facetable materials.